In 2015 with the contribution of the European financing structures (The European bank for Reconstruction and Development, the European Investment bank, the European Union) a program aimed at the improvement of the water supply of Yerevan city was launched. The issue of replacing 30 yard pump stations with energy saving pumping equipment was also included in the program. MAGNA3 opens new vistas by introduction of novel intellectual control modes, an optimized interaction with the control system of premises, and an integrated thermal energy meter. 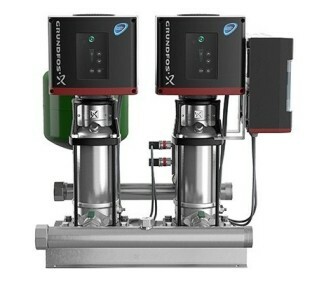 The family of single-unit cradle-mounted pumps of GRUNDFOS Company has been enlarged. Now the whole line of NB and NK pumps is also available in the stainless steel make. Pleasant indoor temperatures and the possibility of instant hot water on demand could be considered some of the corner stones of comfortable modern living. The various types of wastewater must be removed from the home in a secure and safe manner by a system thatguarantees the health and safety of people in and around the building. The MQ is a compact booster with a unique ability to maintain pressure by boosting the mains system or pumping water from a well. The Sololift2 is a compact automatic lifting station with 1 additional inlet connections suitable for pumping wastewater from a washbasin and sewage from a toilet. Grundfos UPS SOLAR is simply unique. It is developed and optimized especially for solar thermal systems with respect to pressure/flow requirements and energy consumption, because standard circulator pumps do not deliver optimum performance in solar thermal applications. Ensuring years of trouble-free and energy-efficient pump operation requires proper maintenance and repairs, which in turn requires that you use original spare parts. If your pumping system consists of standard pumps, you do not need to purchase the necessary parts individually.